Whether you mobile home serves as a seasonal home or a permanent residence for you, a mobile home or manufactured home comes with uncertainties. That is why it is important to insure mobile home. So even when disaster strikes, you can go home. Mobile Home Insurance or manufactured home insurance is a policy that protects property owners from perils like hail, theft, thunderstorms, and fire. The terms of coverage, however, depend upon the policy. They also offer liability protection if someone is injured on their property and other types of financial assistance too, in the case if an owner has to be moved elsewhere because the mobile home has been damaged. It does not cover damages caused by water like floods and tsunamis and has to be covered separately through Flood Insurance. What is Mobile Home Insurance or Manufactured Home Insurance ? Mobile Home Insurance or Manufactured Home Insurance is a type of property insurance that covers four incidents in particular: interior damage, exterior damage, loss or damage of personal belongings, and injury that arises while on the property. When the insured makes a claim against any of these incidents, the insurer covers a portion of the damage, and the rest is paid by the insured. This payment by the insured party is called ‘deductible’ and is agreed in the insurance agreement. When looking for mobile home insurance, it is important that you know and understand all policy options that are available to make a smarter decision to insure mobile home. The problem that a lot of people face is that finding a policy that covers what you need at an affordable price becomes a rather hectic procedure for non-professionals. We at LANDECHE INSURANCE AGENCY have got your back in this regard. We will do the hard work for you and find you the right policy at the right price. Hurricanes, floods, tornadoes, etc. are a constant threat in New Orleans as well as other parts of Louisiana and you need to keep yourself covered all the time. If you do not want to pay the high costs that these can bring, then you are in the right place. We at LANDECHE INSURANCE can save you thousands of dollars by getting you the best policies that fit your needs. It’s a good idea to talk to an mobile home insurance agent located in Louisiana before you purchase one of the above policies because the plans do have many parts to them. You may have questions about what the policy covers or what it doesn’t cover, or how much the policy will cover in case of loss. We can explain all the details of each policy, as well as advise you on how to deal with specific situations. For example, you may have within your contents jewelry, watches, and other precious possessions. The basic mobile home insurance policy only covers $500 of those types of possessions. But what if they were worth a lot more than that? You would experience quite a loss that we could easily help you avoid. If you declare these items on the policy, it would cover their entire value. This is just one example of how we can help you protect your valuables. A lot of people think they are covered until they experience a loss and then realize they are not. 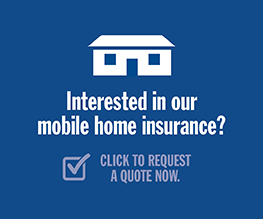 We at Landeche Insurance Agency can help you get mobile home insurance quotes for your Louisiana, residence. Give us a call today!